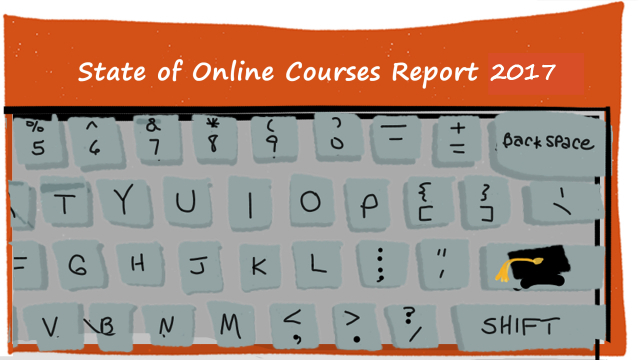 Editor’s Note: The State of Online Courses is now The State of Online Learning. Read the 2018 report here. Is it just me or did online courses just become hot? In the last two months alone, I’ve seen three internet marketers launch training programs on how to create and sell online courses (I’m sure there were more who weren’t in my radar). And we’ve discovered that there are a gazillion online course platforms, learning management systems, and marketplaces for course creators. So many more people are talking about online courses, am I right? I’m pretty confident about this, because we’ve got the numbers to prove it. Since 2015, we at Mirasee have been surveying our audience of service providers, independent professionals, and entrepreneurs to gauge their interest and progress in course building. As you can see, the interest in online courses has remained steady since 2015, except for one thing: more people are in the process of building their online course in 2016 (36%) than in 2015 (20%). This explains the increased flurry of activities around online course building. Where there is a lot of interest, naturally vendors will respond by providing what they need. In this case, it’s training on how to build online courses and the tech tools to create and sell them. Now, what about these outliers who have no interest in online courses whatsoever? What’s up with them? Turns out, the majority of them don’t feel they have the time to put into building and selling online courses (44%)—a perfectly valid point! They probably recognize online courses as a good way to make money online, but it’s just not feasible for them right now due to time constraints. I’d also like to point out that the other concerns seem to stem from a lack of confidence in their ability to put out an online course. Confidence (24%) is fifth on the list of constraints, but it seems that Experience or Expertise (27%), and Course Content Creation (25%) are confidence issues as well. Respondents don’t think they’re enough of an expert to teach others online, and they’re worried about creating course content. Now let’s go back to the vast majority of the respondents who are either interested or already in online courses building. 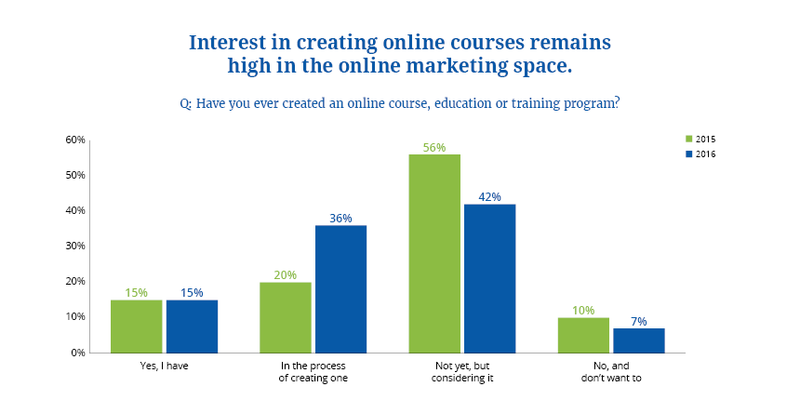 When asked what motivates them to create and sell online courses, the respondents displayed a healthy balance of wanting to give and to receive. The top answer is “to share my knowledge,” followed closely by “to make money,” with slight variations between those who already have an online course and those who are still thinking about it. Why is all this significant? We asked respondents what succeeding with online courses means to them personally. An almost equal number said their biggest reason why is to help people reach their goals (35%) and to achieve their income goals (34%). 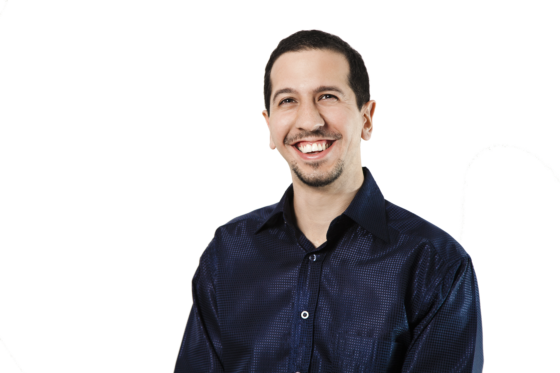 All this is consistent with what Danny Iny, Mirasee founder and CEO, says in his book, Teach and Grow Rich: online course creation is one way to (1) make a meaningful impact to the people you want to serve, (2) achieve your income goals, and (3) have the lifestyle freedom you wouldn’t otherwise enjoy in a traditional job or even a brick-and-mortar business. In an ideal world, online course creators will have students who succeed in completing the course and achieving transformation as a result of it (57%), enough students enrolled in their courses (23%), and as a result, make enough money through their courses (21%). These are the top indicators of a “successful” course. 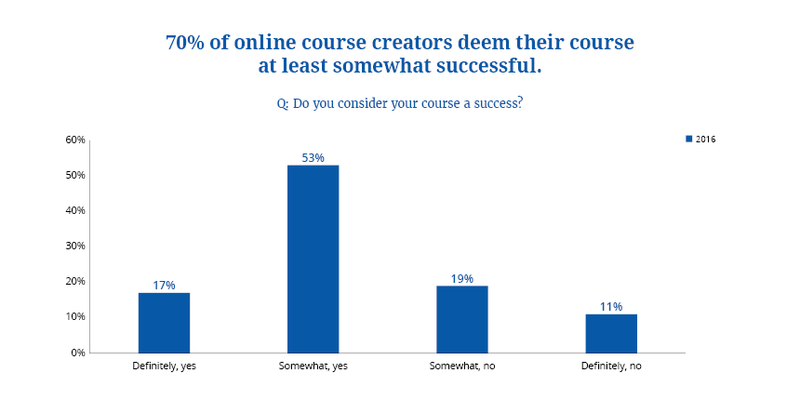 When asked to compare their actual results with these ideals, about half (53%) of online course creators consider their course somewhat of a success. Only 17% say their courses were definitely successful. A third of the respondents say their courses were somewhat to definitely not successful. “What I’m most pleased about is the dramatic increase in creators who view student success as the primary measure of a successful course. However, the fact that proportionately few creators believe that their course is definitely successful means that there’s much more work to be done. Furthermore, the biggest challenges that creators are identifying (marketing) and the measures they’re using for success (creating a quality learning experience) don’t align. Until they do, and creators start putting more emphasis on the challenge that is crafting a quality learning experience, they will continue to miss the mark with student success.” Breanne Dyck, Founder, MNIB Consulting Inc.
Where does the dissatisfaction come from? Part of it may stem from the fact that they’re not getting as many students as they hope to, and they’re not charging the prices they want to charge. 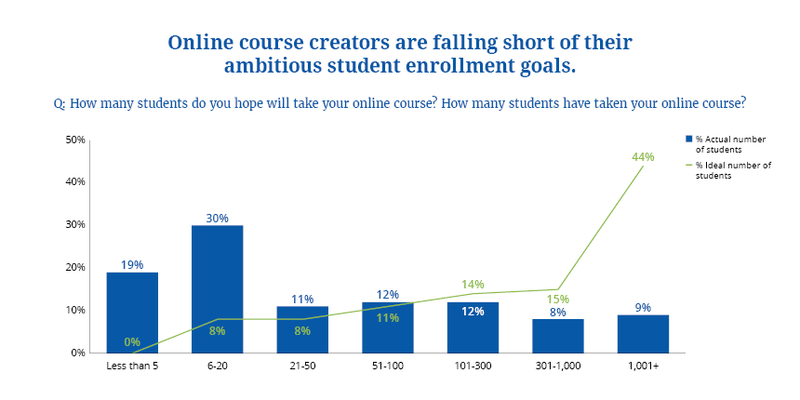 Look at the glaring gap between how many students aspiring course creators want and how many are actually enrolling in our respondents’ courses. While 44% of aspiring course creators hope to get over 1,000 students, only 9% of those who’ve built courses have in fact had that many students. On the other end of the spectrum, only 8% have the modest goal of 6-20 students. But that appears to be the most common enrollment size for our respondents (30%). And here’s the worst part: 19% have had fewer than 5 students! A number which, understandably, not a single one of our respondents was aiming for. The pricing situation is not much better. When you look at the price points from $100 and beyond, you see gaps between how much course creators want to charge and how much they in fact charge. 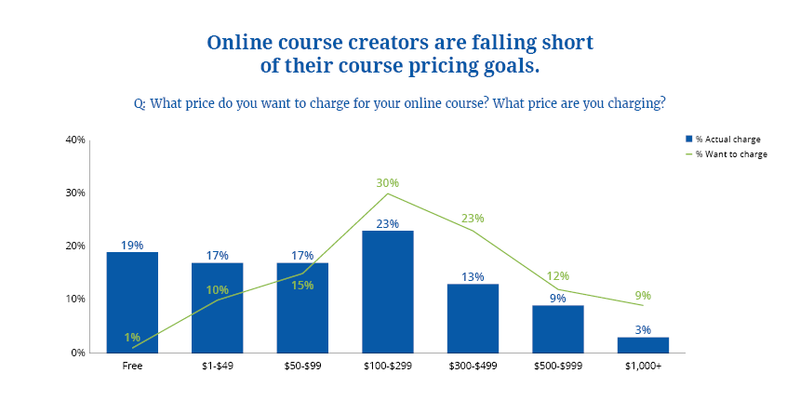 There’s a huge gap in the $300-499 range: 23% of aspiring course creators want to charge that price, but only 13% of course creators have done so. But the largest gap of all is in free courses: Almost nobody (1%) wants to give away their course, but 19% do. Curiously, only 9% want to charge $1,000 or more. Is it because they don’t think the market will pay that much? Or is it because they don’t think the value of their courses is $1,000 or higher? The most desirable price point seems to be between $100-$299—which would be terrific, if course creators were getting their targeted 1,000+ students. That’s a minimum of $100,000, which makes a pretty good annual income. But sadly, most online course creators don’t experience this. The most common number of students is 20 and the most common price is up to $299. That makes for a grand total of $5,980. This means they don’t get to quit their day jobs. They don’t get to help as many people as they want to. And they don’t get to enjoy the lifestyle of their dreams. Even though our respondents’ courses may be effective, in the sense of creating transformation for their students, they’re neither getting enough students nor charging as much as they want to. In terms of impact and income, many online courses are in fact failing. When asked about their biggest impediment to success, respondents answer slightly differently, depending on whether they have already created a course or are still thinking about it. 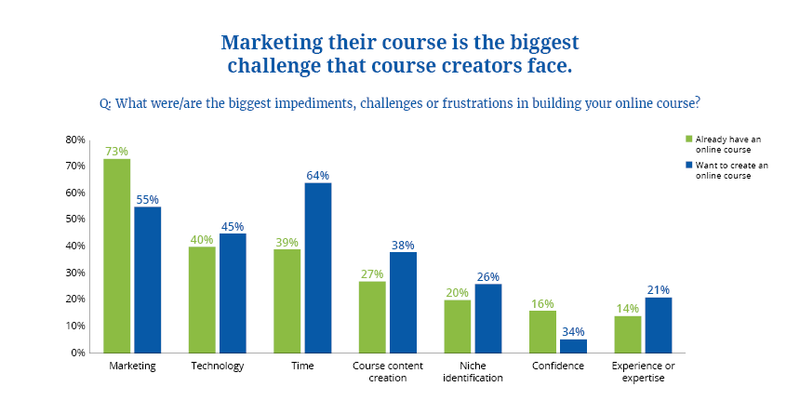 For those who already have an online course, the top challenges are marketing (73%), technology (40%) and time (39%), course content creation (27%), and niche identification (20%). 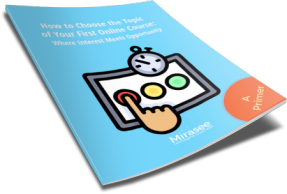 But for those who want to create an online course, time (64%) is the main challenge that’s keeping them from following through on this desire. But even this group who doesn’t have a course to sell yet is already anxious about marketing (55%). It’s an even bigger concern than technology (45%), course content creation (38%), niche identification (26%), and other frustrations. Either way, marketing seems to be the X factor. And our respondents have a point. Effective marketing will help them fill their courses and charge the price that makes online courses worthwhile. More and more people are trying their hand at creating online courses. They want to share their knowledge, make money, and reach more people. But these expectations aren’t being met. They’re not getting nearly as many students as they hoped to enroll. And they’re not able to charge as much as they want to. They know that they need help with marketing, most of all. They also want help to use the technology involved and either finding or making time for course building. Will the industry meet their needs? Will they be committed enough to overcome the challenges of online course creation (or any business for that matter) and eventually achieve their goals? What do you think? Thanks for publishing this very useful article. Top notch writing and very useful graphs. I am considering an online course creation and it is perfectly timed. I will follow your articles.. Wow!!! This is an awesome study and nearly in line with what I was thinking about the industry. You’re right, ecourses are taking off everywhere. I’m a bit late to the game I guess, but I just started a site of my own to help bloggers and individuals develop, and promote their own ecourses. It’s brand new but with what I’m seeing in the industry, it seems to be a needed additional source for marketing an ecourse. I’m also in the process of developing my own ecourse so this study is even more relevant to me. Thank you. @Richard – Hello! Thanks for your comment. I don’t think you’re late to the game yet, because as you can see from our survey results, online entrepreneurs are still trying to figure this stuff out. I hope you’ll check back frequently, because we’re going to publish a ton of content for course creators. Watch out for it! I found it especially interesting that 44% of folks would like to have 1000+ students. Having taught in the classroom and online, I can say that 1000 students is more than one person can manage. 1000+ students is a goal to build up to, for sure! But starting out, it is so much better to have a small number of students to learn and grow with. Loved the graphs as well. Thanks! @Lizzie – Excellent point about starting out with a small number of students. Guess our audience would eventually like to have an online course empire, possibly with their own support teams to take care of their 1,000+ students. Thanks for your note! I’m curious – did you go through a few versions of your course before creating the current version it’s in? How did you know that students would be successful? What do you do within the body of the course to encourage people to continue on, not give up, and eventually complete it? Like Lizzie above I think this summary is a great reminder to build your connection with your audience and develop content slowly and methodically as you figure out what meets their needs. Mirasee’s formula and expertise in this are invaluable. Hey there, thanks for your kind words, @Calvin! Good article. The most important point you mention is the one that most course creators miss. And that is the need to establish a market first by building a good relationship with a tribe or perfect prospects and then offering them your course as the perfect solution to their problem or pain. The second point is the need to either gradually build up the number of students so they can be properly managed, or come up with a viable group setting where the students themselves are taught how to help and support each other with the course creator as the facilitator. Otherwise as you pointed out, things can get out of hand very quickly. @Laurence – Thanks for dropping by and leaving a comment! The value of “community” in online courses is coming up as an important theme in our discussion with online education experts. More on that coming soon! Glad to read your informative post and I’m totally agree with your whole points. Online open courses really makes education easier for everyone, we know very well today in new era technology makes comfortable and easy for everyone in any-field. Day by day, education level is growing with online courses. Online courses will be very helpful to generate high profit by effective strategies such as while selling online courses in specific enrollment periods, helpful to generate large group of students. Eventually, thanks for reveling a light on this wonderful burning topic. Your article did not surprise me one bit! Clearly entrepreneurs want to make money and selling is the name of their game. However, helping, educating and teaching is not a game – rather it’s a passion that fueled by emotional reward, changing lives, and giving. Perhaps if marketers would give without the possibility of getting, they would see their numbers grow exponentially – look at the Khan Academy!